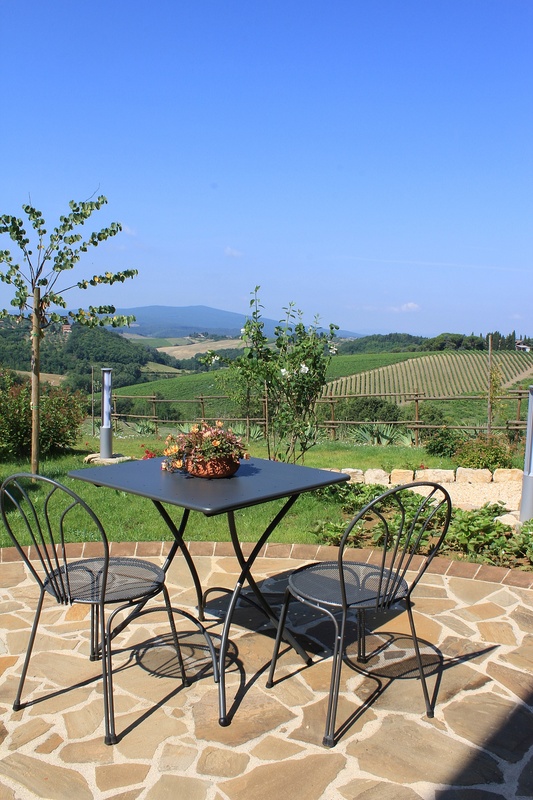 In the heart of Chianti Classico, yet a mere 10 minutes drive to Siena city centre, Le Redi offers a truly magical nest away from the crowds, enjoying all modern commodities in full respect of the environment. Le Redi is, in fact, a perfectly balanced example of modernity and tradition. 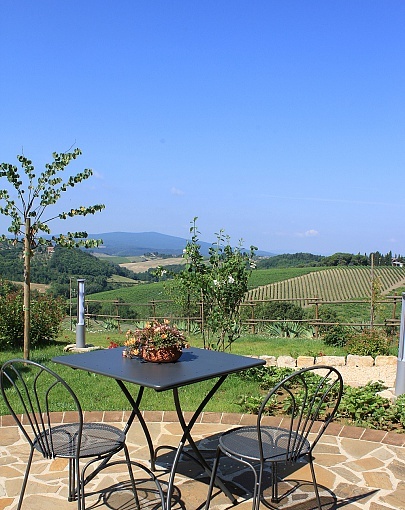 Set on the side of a very panoramic Chianti hill, Le Redi is furnished with a mix of antique country furniture and modern items to ensure a relaxed, romantic, yet comfortable experience in every season. Geothermal heating and cooling is used to keep the temperature constant throughout the year. The ground floor of the house hosts a twin, a double and a single bedrooms and a large bathroom with both shower enclosure and bath tub. The large living area occupies the entire first floor. This floor hosts a fully fitted kitchen, a large living room with sofa, fireplace and a dining area enjoying the beautiful views and lovely breezes. At the back of the first floor sits a second lunge with a double sofa bed. The living room is equipped with sat tv, dvd, hifi. The whole houses has pavement cooling and heating system. The houses is surrounded by a large panoramic garden, equipped for outdoor cooking, eating and relaxing. The nearest village is Quercegrossa, just 800 meters away, reachable through a comfortable - and very calm - road. The bells of Fedro’s cows, a donkey and two horses will keep you company in the valley. In Quercegrossa there are bars, restaurants, a shop, a supermarket, a pharmacy, a sports center (with two tennis court too) and other commercial activities. During the summer period the Sporting Center organizes fairs and festivals, famous throughout the province for their excellent and genuine homemade cuisine. The owner, Sara, is a young and passionate trekking guide, who is also certified Siena tourist guide. The house is a gift from her parents, who cherish her love for the environment. She is always at hand to give you information for a truly genuine, slow moving holiday in Tuscany, with or without her as a guide. The house does not have a pool but, the fantastic water park of Quercegrossa is a mere 5 minutes drive away. A file that shows a lot of useful information for your stay, including: instructions for appliances; instructions for recycling in the province of Siena; phone numbers and emergency services; promotion of public or private transport with information on schedules and lines, where to buy tickets for local transport and the promotion of bicycle paths; promotion of traditional and /or organic food shops; opening times of pharmacies, supermarkets, postal services and all that may be useful during your stay.